It has been ten years since Stowmarket’s very own record label was formed by entrepreneur Peter Purnell, following an inspirational lunch with Gillan’s ‘big bald bassist’, John McCoy. Angel Air (so named by Peter’s wife and business partner Shirley), set out from day one to offer the customer excellent value and the musicians, writers and artists, decent treatment, fair royalties and major control over the finished product. Angel Air has earned itself a deserved reputation as the Indiana Jones of the music world, rescuing classic albums from a bygone era, dusting them off and releasing them with copious sleeve notes and a wealth of bonus tracks. 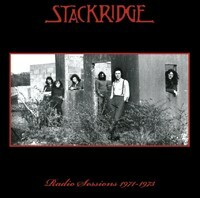 Often however, the label can be found releasing recordings that have never seen the light of day, including delightful demos and lost live sessions, to the delirium of life long fans. 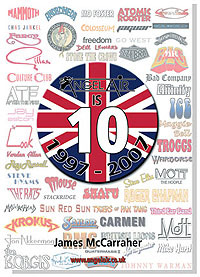 With over 250 releases under their belt, Angel Air can boast a roster that includes such diverse acts as Mott The Hoople, Stackridge, Gillan, Maggie Bell, Freedom, GoWest, Mike Hurst, Medicine Head and Atomic Rooster. ‘Angel Air is Ten’ tells the story of the label, explores the Angel Air philosophy and carries a biography (and reviews) of each and every release from the past ten years. James McCarraher was born some forty years ago in Hythe, Hampshire, an idyllic village on the edge of the New Forest in Southern England. Although a trained lawyer by profession, James first dipped a toe into the literary world in 1996 and has never looked back. ‘Angel Air Is Ten’ is James’ sixth book and third focussing specifically on the subject of music. He cites Paolo Hewitt, Richie Unterberger and Robert Goddard as his literary inspiration.